Tradition is everything in the Majors. And that includes being daunting. Phil Mickelson's had his share of run-ins with it, and he's emerged worse for wear as often as he's prevailed. Kudos aside, Round 1 was played in ideal conditions. Royal Troon has more to offer than that. Seven players have carded 63 in a major, but only two have managed to break par the following day. That number has now grown to three. Mickelson again flirted with an historic shot, this time at the Postage Stamp, Royal Troon's notorious eighth hole. As in 2013, Mickelson's being chased by Henrik Stenson, who posted quite a season that year but never broke through in a major. The Swede picked up a trophy at the European Tour's BMW International in Germany last month. Dude's as ready as he's been the past three years, and he'll be paired with Mickelson in the third round. Running the table in any tournament is tough enough, but on a links course, the challenge is amplified. 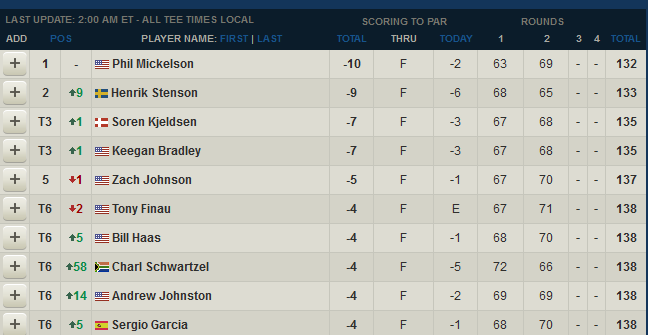 Part of Mickelson's history in majors is self-immolation, especially when he gets needlessly aggressive on his drives. At the halfway point, dude's kept his howitzer in the bag during the tempting moments. But there's still a bit of Arnie in his DNA. It's dramatic, but at Royal Troon, it may not be a good thing.